wet friends on a plank. 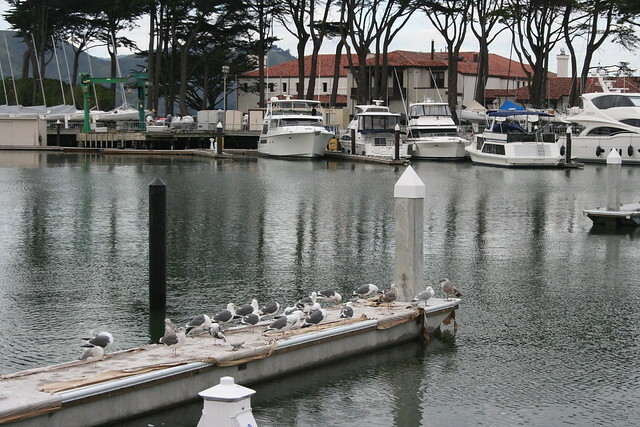 I was walking past the marina just north of the Exploratorium in San Francisco in late December, 2012. I noticed that one of the docks was dotted with birds trying hard to ignore the drizzle. A bunch of gulls is called a “screech,” but this one wasn’t screeching much. I thought it made a nice shot with the black and white pillars, the texture on the water, and the boats and trees in the background. The Golden Gate Bridge is hidden by the red-roofed building in the background. This entry was posted in Photos, Poetry and tagged birds, boats, docks, drizzle, gulls, haiku, marina, rain, seagulls, water. Bookmark the permalink.